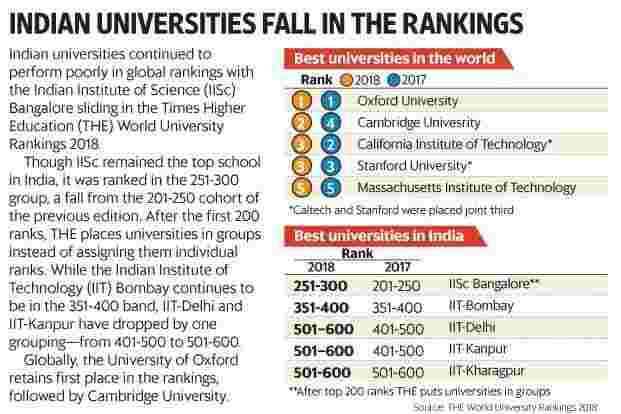 New Delhi: Indian institutes continued to perform poorly in global university rankings with Indian Institute of Science (IISc) Bangalore sliding in the Times Higher Education (THE) World University Rankings 2018 published on Tuesday. Though IISc remained the top university in India, it was placed in the 251-300 groupings of the best universities, a fall from the 201-250 cohort of the previous edition of the ranking. After first 200 ranks the UK-based university ranking agency THE places universities in groups instead of assigning them individual ranks. IISc, IIT Bombay, IIT Delhi, IIT Kanpur and IIT Kharagpur were the top five Indian schools in the 2018 rankings. IISc slid largely due to drops in its research influence score and research income, the ranking survey said. While the Indian Institute of Technology (IIT) Bombay continues to be in the 351-400 band, IIT Delhi and IIT Kanpur have dropped by one grouping—from 401-500 to 501-600. “It is disappointing that India has declined in the THE World University Rankings amid increasing global competition. As leading universities in other Asian territories such as China, Hong Kong and Singapore are consistently rising up the rankings, in part thanks to high and sustained levels of funding, India’s flagship the Indian Institute of Science moves further away from the elite top 200," said Phil Baty, editorial director of global rankings of THE. Indian universities performed poorly on internationalization, which measures how successful a school is in attracting foreign students and staff, a traditional shortcoming of the Indian institutions. “Government policy strictly limits the number of students from abroad who can study in India and prevents international scholars from being hired into long-term faculty positions," THE said in an email. It feels that the rankings may improve in the near future as Indian schools go about improving the internationalization aspect. Although India has put on hold plans to bring in foreign universities, the government in August cleared a proposal to establish 20 world class institutions by relaxing regulatory norms and pumping in extra funds. Once in place, this is expected to bring in more foreign students and faculties to India and may help raise the profile of its universities. Baty said Indian schools’ “research income and research quality has risen this year" and that the world class university plan indicates that the Indian government recognizes the “importance of investing in higher education, which may reverse India’s decline in the rankings in future years". Overall, 1,000 universities from 77 countries were ranked by the THE. Though the US continues to be the top country in terms of the number of universities in the top 200, China this year continued to rise with two of its institutions finding a place in the top 30 for the first time.